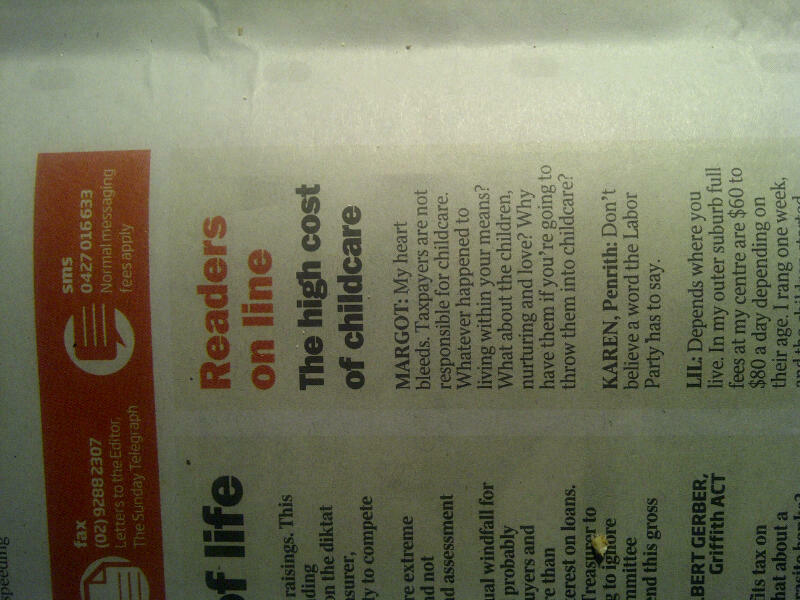 I was cleaning out the soiled newspaper from the chick cage yesterday when I noticed an opinion column about childcare. It made me so cross, I wanted the chicks to poo on it (but they crapped on the weather instead, which is understandable.) It was filled with moral outrage from readers. The most annoying stuff was written by women, which really, really, really got on my goat. I hate it when women start being judgemental about other women’s childcare choices. There were cliched comments like “why have them if you’re going to throw them into childcare?” and “If women are going to have babies, bloody stay home and look after them.” Hello? We’re not living in the 1950s. One look at the average mortgage is testament to that. It’s also been generally acknowledged that women have equal rights to men these days. Yes, really. So why is it solely a woman’s responsibility? How about hubby gives primary childcare a go? Mine did it for six months. He even appeared on 60 Minutes, singing its praises (well, the phrase “nail my balls to the letterbox so everyone can see I don’t have any” might have been mentioned, but he was generally positive about the experience.) I’ve been at home for seven months now, taking care of the kids. And I love it. Mostly. But I’m not going to flagellate myself if I get a job tomorrow. I’m a good mother, whether I work or not. Sharing a nanny, daycare, sending the Sprogs to after-school care – all of which I’ve done – doesn’t change that. My kids have simply had more people to love. When Sprog 1 was nine months old, a wonderful woman entered our lives: Nanny Catherine. Catherine helped care for my children for more than seven years, until I stopped work in July. The Sprogs adore her – we had lunch together last week. A woman came up to me in the park once, asking if I was the Sprogs’ mother. When I answered yes, she said, “I’ve watched your nanny with your children and she loves them like they are her own. I thought you’d like to hear that from a stranger who’s seen them together.” So don’t tell me my children have been disadvantaged by the choices I’ve made. Women work for many different reasons – often when they’d prefer to be with their children – and they deserve support, not bile. This entry was posted in LIFE and tagged motherhood. Bookmark the permalink. Hi- just chiming in from a different angle. I have worked in the child care industry for the last 10+ years, and I wonder how many folk share a thought for the gruelling work we do- for a very low salary. Many of us cannot even entertain affording a mortgage in Sydney. I love my work, I feel I am actually contributing to society and not just trying to climb the ladder of materialism. But do you think we are appreciated?Certainly not by the people in power who decide what we are worth per hour. Just a thought! Hi Sarah, that’s a tough one. Childcare workers get paid far too little when such precious lives are their responsibility. But how do we keep costs down? Lots of mums I know are paying $140 a day for care. How can they afford more and keep working themselves? Is the answer more government funding do you think? I have so much respect for child care workers. Your work must, indeed, be “gruelling”. I know mothers who have elected to go back to work (full time or part time) rather than stay at home with their toddlers because caring for toddlers is so relentless. They describe being back at work as their “break time.” You guys deserve much better pay, as do most nurses and school teachers. Alana, you responded that you know mums who pay $140/day for child care. As a working mother on a very average wage, who could never have afforded such exorbitant rates, I feel that people who can pay $140/day for child care don’t “need” child care subsidies. They might “want” them to help pay off their crippling mortgages, but, seriously, if you are paying $140/day and it’s still worth your while going back to work, then you must be on pretty big bucks. How are child care subsidies paid? I never claimed any. I think child care subsidies should be paid at a flat rate. The corporate superstar who earns $200K/annum should only be entitled to the same subsidy that the cleaner who vacuums her office at the end of the day is entitled to. The cleaner’s child care centre might cost $70/day and the corporate supserstar’s $140/day but the subsidy should be the same. I never applied for the subsidy so I’m at a bit of a loss. $140 is the going rate in inner Sydney, no matter how much you earn, everyone is paying at least $100. It’s pretty scary. I’m pretty good at programming a computer. I’m probably average or worse at looking after kids 8 hours a day. If I program for a living I get $100K and can pay someone above average to look after my kids. The kids are happy, I am happy. Someone get a job looking after my kids, I get to earn money and make money for Australian business. The government gets to tax us all… what exactly is the problem here? I guess I could look after my kids badly, claim some sort of unemployment benefit and have someone in childcare lose their job… That’s much better, right? Those child care costs are totally crazy. Totally crazy. I live in the Land of the Subsidised Child Care and pay pretty well nothing for exceptional care (well I pay tax). 3 adults to 10 kids + it’s a music daycare with specialist educators. My hubby also took 6 months off to be the primary carer for our daughter – again subsidised so he received 80% of his pay. The best 6 months he ever had and money well spent by the government. The teachers are paid in general o.k, not great but not overly bad. They should get paid a lot more though! How divine – music daycare. Love it. Her Abba songs are really coming along. Ah, I love ABBA. Eternal dag.